Fly private and indulge in the unrivaled luxury and beautiful surroundings of Cyprus, officially known as the Republic of Cyprus, an island in the eastern Mediterranean and a popular destination for luxury travelers. Renting a private jet is the best way to start your vacation to Cyprus, and our team is here to become your partner for luxury private jet rentals, helicopter transfers and yacht and catamaran charters during your island getaway. Air Charter Advisors offers on-demand private jet charter service to/from the Republic of Cyprus. Our services extend around the world, whether you’re vacationing from Europe, the Americas, or anywhere in between. We have access to thousands of luxurious, stylish private jets based around the world, and we’re confident we can connect you with the perfect aircraft to complement any lavish Cyprian holiday. Safety is our company’s number one priority, and our team goes the extra nautical mile when reviewing potential options for your trip. Our private jet charter company is Wyvern-certified, one of the highest accreditation standards in private aviation. Using up-to-the-minute reporting tools, we review aircraft maintenance, operator history and pilot experience when selecting aircraft and crew options for your flight. The aircraft we use for Cyprus charter flights are operated by FAR Part 135 or 121 (or foreign equivalent) air carriers, giving you peace of mind when arranging your flight with us. Our clients have ranged from distinguished passengers such as royal family members, heads of state and C-level executives, to VIP celebrities, personal assistants and leisure travelers visiting this tropical paradise. Enjoy the peace of mind you get from working with an air charter company you can trust, and we’ll become your aviation solution for luxury air charters, airplane acquisition and private aircraft management in Cyprus and surrounding areas of the Mediterranean. Call or request a quote for jet charter service to the island of Cyprus. Whether you’re interested in chartering a flight, purchasing an aircraft, having one managed or want to know more about private aviation – consider Air Charter Advisors your comprehensive solution for all things private aviation in Cyprus. A major tourist destination in the Mediterranean Sea, the Republic of Cyprus is the third largest island in the Mediterranean Sea following Sicily and Sardinia, and although the island is geographically located in Asia, it is politically a member of the European Union and has been a member of the Commonwealth since 1961. Home to an advanced, high-income economy and a high Human Development Index, the Republic of Cyprus attracts over 2 million people from all parts of the world, although nearly half of its visitors come from Great Britain. One of the most popular attractions on the island is the Sanctuary of Aphrodite. This ancient site is home ruins of a hilltop temple dedicated to the goddess of love. The Sanctuary is located the coastal city of Pathos, her legendary birthplace — idols have been found of thefertility goddess dating back to nearly 4000 BC. Scuba divers delight in exploring the clear waters and colorful fish that surround the Wreck of the Zenobia. The ferry sunk on her maiden voyage in 1980, and its remains are located around 25 miles outside Larnaca Harbor. Located 25 miles from Larnaca you’ll find the Stavrovouni Monastery, a sacred site containing a piece of the Holy Cross left by Saint Helena. More ruins can be discovered northwest of Larnaca at a site known as Kition, home to giant stones from five temples that date back to the 13th century BC. The Troodos Mountains are located in the middle of the island, and the famous mountain range is best known for Mount Olympus, its highest peak and home to the Gods of Greek Mythology. Visitors can celebrate the Goddess Dionysus along the island’s wine regions, located in the foothills of the Toodos Mountains. The region is where Commandaria, a sweet, amber-colored dessert wine and one of the oldest wines in the world, is produced the same way since 800 BC. 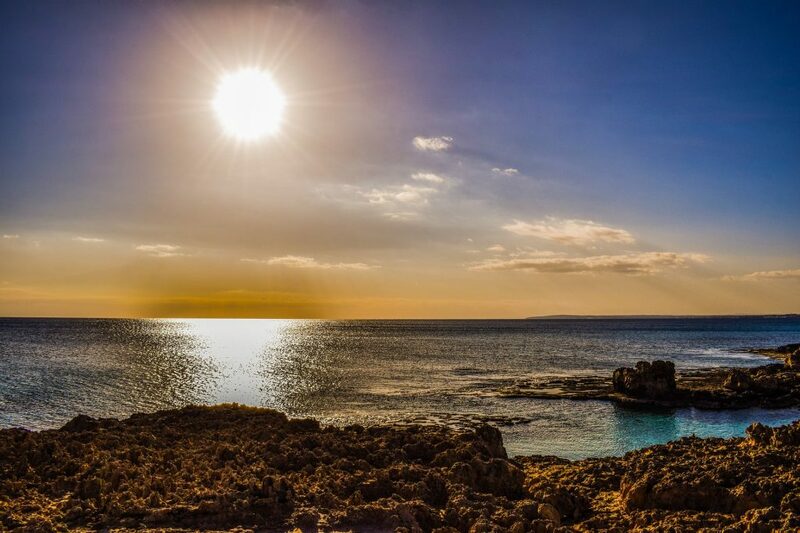 Ayia Napa is a resort town 35 miles east of Larnaca, and it’s the place to go for visitors looking to party. Featuring more than 80 bars and 12 nightclubs, Ayia Napa hits its peak between midnight and 4 am as bars begin to close and the streets turn into one big party. 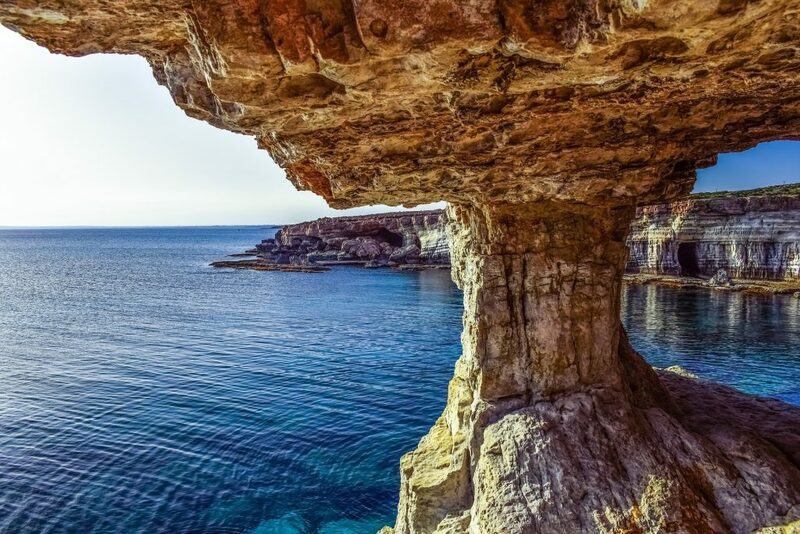 Go cliff-diving at Cape Greco, a national park located between Ayia Napa and Protaras; the park is home to caves and deep passages in the cliffs that are only accessible from the sea. 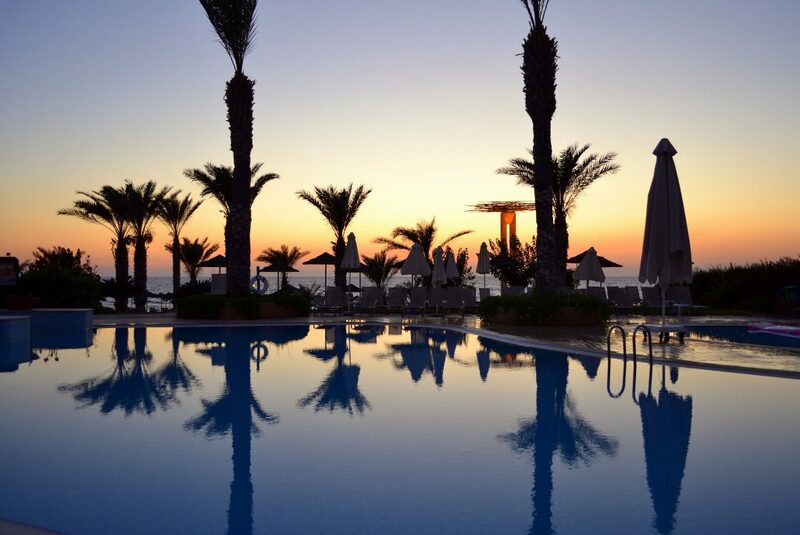 Cyprus has a subtropical climate with very mild coastal winters and warm/hot summers. The average annual temperature on the coast is around 24 °C (75 °F) during the day, and 14 °C (57 °F) at night. The only possibility of snowfall on the island is in the Troodos Mountains, located in the middle of the island. Rain occurs mainly in winter, with summer being generally dry. The island was originally placed under British administration in 1878 and formally annexed by Britain in 1914. However, Turkish Cypriots made up nearly a fifth of the population, and Turkish leaders advocated for the annexation of Cyprus to Turkey as Cyprus was considered an “extension of Anatolia”, and a partition of Cyprus and the creation of a Turkish state in the north became a policy of Turkey in the mid-20th century. 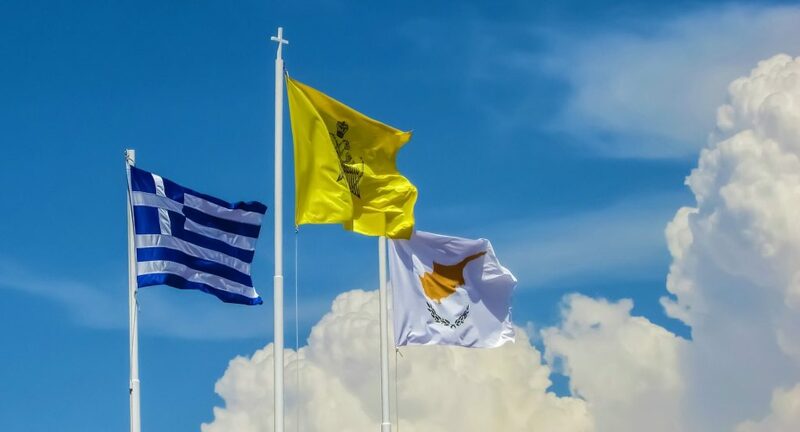 After a rise in nationalist violence for through the 1950s, Cyprus was granted its independence in 1960. The Republic of Cyprus has sovereignty over the island, as well as its territorial sea and exclusive economic area, according to international law — an exception is made for the British Overseas Territory of Akrotiri and Dhekelia, which is administered as Sovereign Base Areas and accounts for less than 3 percent of the island’s area. 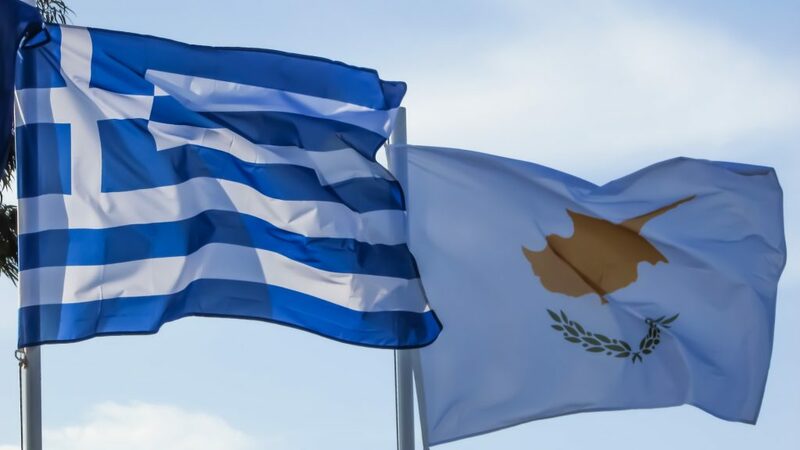 That said, the Republic of Cyprus is partitioned into two parts: the area under control of the Republic to the south and west, and the north, administered by the self-declared Turkish Republic of Northern Cyprus; a small UN buffer zone seperates the two. Adding a private luxury yacht charter to your Cyprian getaway puts you in the Captain’s seat for your voyage throughout the Mediterranean, and ACA can handle all the maritime arrangements for your crew. Our has experience working directly with yacht providers from Cyprus and around the globe to connect our clients to the perfect yacht while on holiday — we’ve worked with every one from Miami to Montauk all the way to the Mediterranean. Speak with one of our brokers and let them know your goals; we can accommodate budgets up to seven figures per week and beyond. Set sail on your own voyage by adding a yacht charter to your trip to the Republic of Cyprus. ACA has access to the following Wyvern-certified aircraft for your flight. All of the aircraft we utilize for air charter service are operated by FAR Part 135 or 121 (or foreign equivalent) air carriers, using only veteran pilots in the private jet you’re renting. Our team will provide you with a variety of aircraft options based on the goals and budget of your trip, allowing you to charter a cost-effective aircraft, or the most luxurious, stylish corporate jet on the market. Check out our Aircraft Gallery for more details on all of the aircraft available for your trip. Air Charter Advisors utilizes the following airports to fly clients privately to/from the Republic of Cyprus. Our services extend around the globe, and we offer on-demand availability 24 hours a day, 7 days a week. Request a Quote or give us a call at 1-888-987-5387 to speak with one of our Cyprus Private Jet Charter service brokers for your next luxury vacation, business trip, or special event.